Myself Bill Walsh, John Killeen and Glyn Barnett won the Skegness over 55s 3 wood triples tournament, players from all over the country to enter the event, which is 4 wood singles, 4 wood pairs and 3 wood triples, played over six days the three finals held on the Friday. We managed to get a bye in the first round, then we played four rounds on the Wednesday finishing late in the day, Thursday we played three more rounds plus the semi final winning 17 – 12. 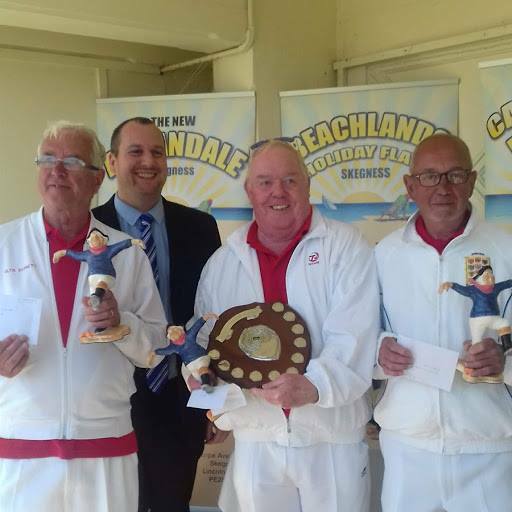 On the final day 22nd June we played a team from North Nottinghamshire and what a great final it was winning on the very last end to win 15 – 14 and receive a shield, a jolly fisherman and £600. Players: John Killeen Enterprise Bowls: Bill Walsh Ilkeston Victoria Park: Glyn Barnett Long Eaton Town bowls club. Also a mention for Dave Wilson of Ilkeston Victoria Park bowls club who got to the semi final of the 4 wood singles. All in all a great week of bowls.